I've posted this on other forums and would like to share it here as well. 19th Century Indo Persian Kard single edged T shaped blade. 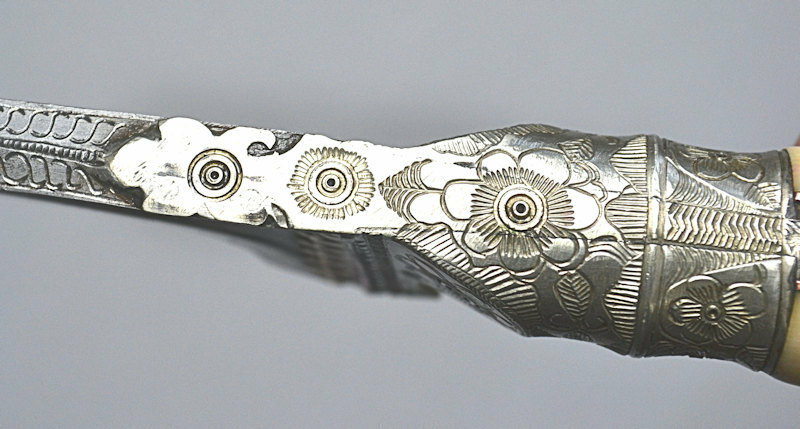 Feint floral etching, white metal floral engraved ferrule, blade spine and grip edges. Polished bone bird beak slab grips retained by four dome head rivets. Contained in its red tooled leather covered wooden scabbard. Profile taper: 1.76'' (44.7mm) at ricasso, narrows immediately to 1.09'' (27.9mm), 0.74'' (19.0mm) at mid blade and straight taper to a sharp tip. These is feint etching to blade and crisp detailing to the white metal (white brass) mounts.Grip scales appear to be ivory. 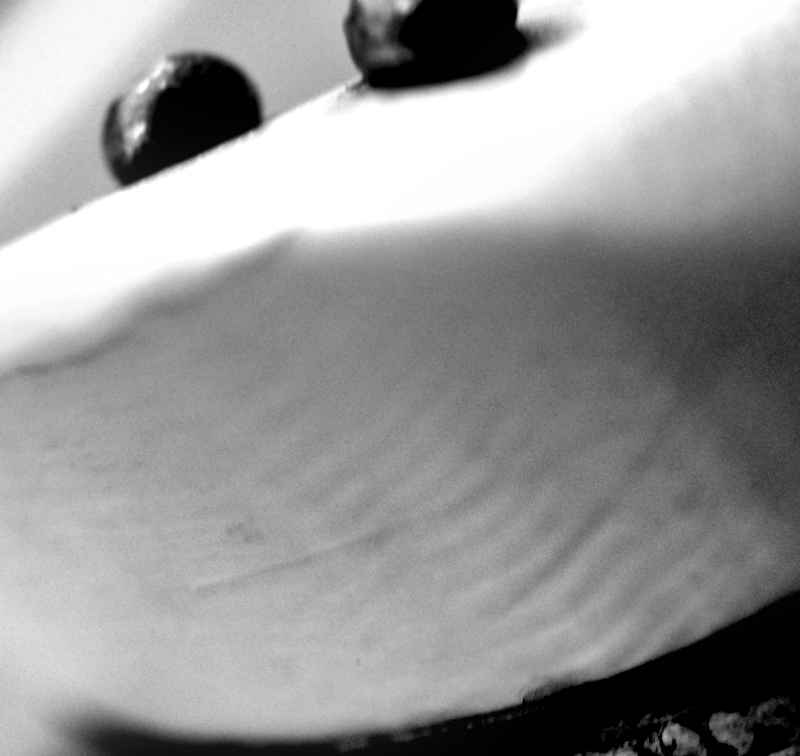 Detail is hard to capture but I have included an enhaced black and white image of the rear of the grip. The tooling on the scabbard includes brass surrounds to cutouts revealing coloured metalic foil beneath. All comments on opinions gratefully received. David, your heading is correct (choora), the auction description in not correct at all. These particular Afghanistan daggers are often incorrectly described as being "kard, pesh-kabz, karud" but the correct term is "choora". 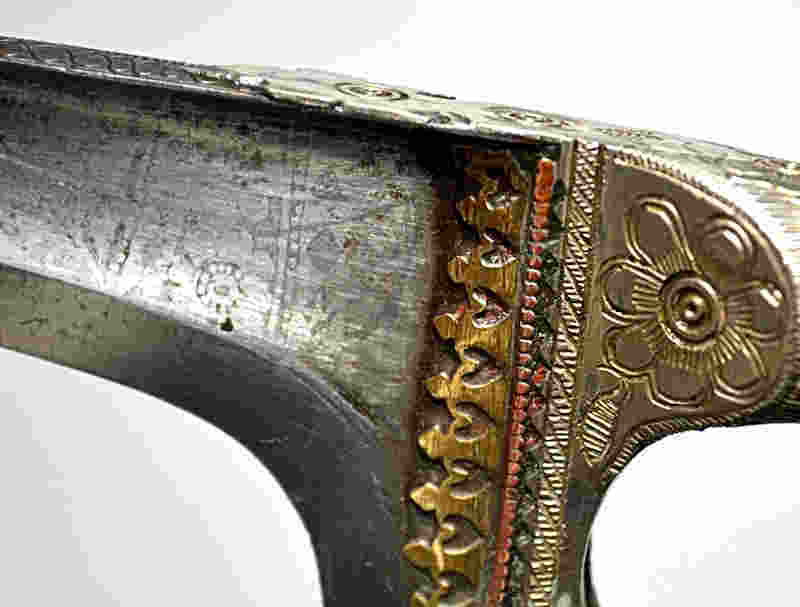 While a "kard" is a straight bladed, single edge dagger, the choora is actually more closely related to the straight bladed, single edge "karud" dagger, which is closely related to the curved bladed, single edge "pesh-kabz" dagger. I posted some descriptions and images below. Karud: Primarily a mail piercing, straight bladed dagger. 10-18 inches long. Blade abruptly narrowing at its base, with a pronounced T spine and many times with edge reinforcement rib. Massive handle, one piece or two slab grip on a full tang. It is well distributed in India, Pakistan, Afghanistan, Persia and Central Asian Countries. They all show a similar blade and differ mostly in handle materials and scabbard decoration. Choora: This is also a development of the karud with a similar T spine blade, but usually smaller, 10-12 inches long. 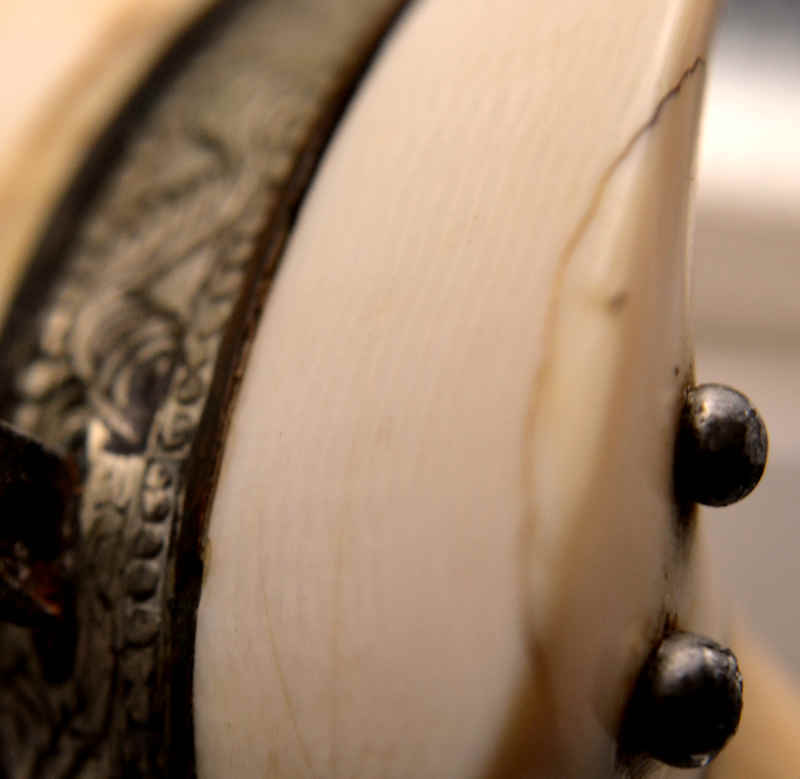 It has a very typical handle with grips composed of two or three sectors of metal, ivory, horn or a combination of all, with the pommel tips extending down more than in its brothers. Its distribution is limited to the areas around the borders of todays Pakistan and Afghanistan. It should be mentioned that later made such daggers are widely found in various antique arms fairs with a variety of grip materials ranging from wood to modern plastics. Pesh-Kabz: A development of the karud, with a similar but re-curving blade (usually T spine) and slightly down curving handle, perfected to be the best mail piercing blade. Reinforced edge and sometimes thickened tip. Two slab grip. It is well distributed in India, Pakistan, and Afghanistan. A couple of comments about your choora, and choora in general. I am not so sure that the hilt of your choora is bone, a better close up image would help, it could be ivory. As for judging its age, I can see no way of coming closer than between the late 1800s to the 1900s. Choora seem to have simply appeared in Afghanistan at an unknown point in time and even the name is a mystery without a known source. It has been suggested that choora took the place of other Afghan bladed weapons during the time period that the Afghans were in the process of trying to upgrade their fighters to more modern firearms instead of their beloved jezail flintlocks. 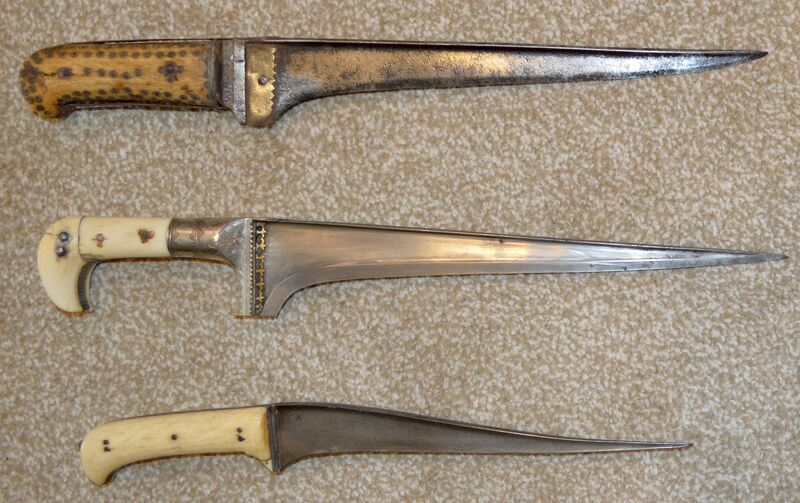 With the use of modern pistols / rifles and with armor no longer in use, sword / knives / daggers were no longer as important of a weapon to the Afghans. The choora that I have seen do not have the thicker point of older pesh-kabz and karud daggers, they seem to be more oriented to cut through clothing with a very sharp but thin point, in fact I have seen several examples with damaged blade tips. Below is the only image I know of that show Afghans with choora. Afghan warriors (Waziristan Mahsuds), 1920 from an album of 65 photographs compiled by Major General W M Kirke, Waziristan, North West Frontier (1920-1937). National Army Museum, Study collection. 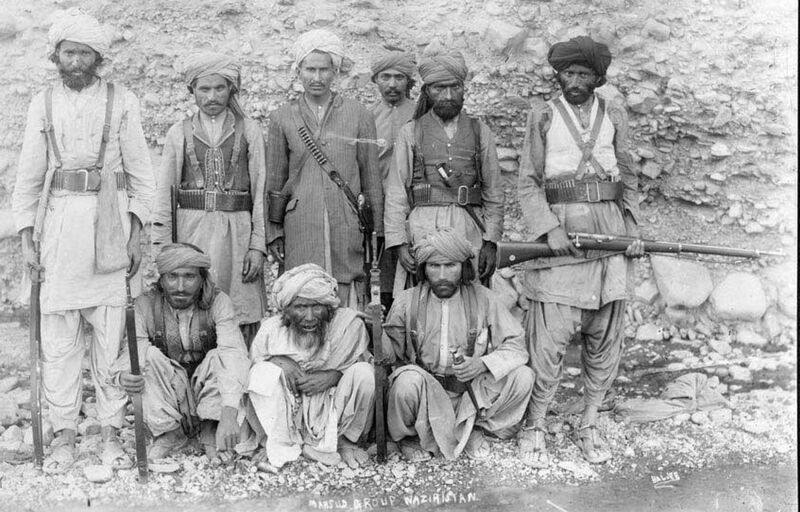 Pathan tribesmen, probably the most formidable frontier fighters, highly mobile, able to live off small rations, fine shots, perfectly adapted to a mountainous homeland. Fiercely independent, fighting skills honed by years of raiding settled areas trading caravans, estimated 11,000+ warriors 1919. Thank you Eric. I am now pretty sure that the hilt is ivory. I'm sorry the magnified photos I posted are the clearest I can manage but the schreger lines do seem to be there and the pitting normally associated with bone is absent. As long as the hilt is pre 1947 I am happy to have it. The modern ivory trade must be stopped but we cannot loose sight of the fact that ivory was part of the cultural heritage of many peoples around the world. David, this is why some dealers are now saying that the ivory in the items that they are selling is "bone".